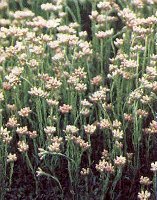 Also known as Gnaphalium dioicum, Cats Ears or Pussytoes, Antennaria is a small rock garden perennial plant with white, wooly leaves and stiff heads of white, grey, or pink blooms. 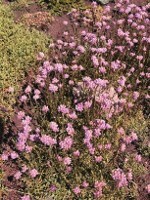 They are also referred to as a walk on plant. Closely related to Edelweiss, they make excellent cover plants for hillsides or rocky slopes or placing between paving stones. Members of the daisy family, Compositae, they grow wild in parts of Europe and North America. Plants can be propagated by sowing seed or by digging and dividing existing plants in the early spring. Seeds should be sown in pots, trays or beds prepared with 1 part sphagnum peat and 1 part sand. Cover lightly and keep moist at about 70F. When seedlings reach about 2 inches in height, they should be transplanted in to larger containers or outdoors, if outside temperatures are staying above 65F. Antennaria has been used as a diuretic, and as a treatment for bronchitis, gall bladder problems, and hepatitis, though it is little used today.